40 Days in Paris > Bienvenue à 40 Jours à Paris: Are the French open to fancy footwork on the court? 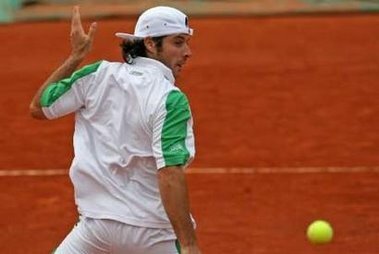 Are the French open to fancy footwork on the court? It's not like a Frenchman to stray too far from tradition, even with sports. These photos, taken during the French Open at Roland Garros yesterday, seem to suggest that French players have introduced some peculiar new moves to their game. But, don't be alarmed. I'm sure these hijinks are the product of a camera's shutter opening and closing at just the right (or wrong?) time. 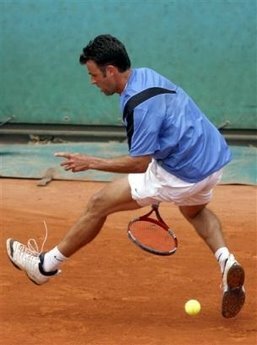 Marc Gicquel (top) appears to be playing futbol rather than tennis. Or is he riding an invisible polo pony across the court? In the second photo, Sebastien Grosjean looks like he has blended some kickboxing and ballroom dance moves into his game. Or, like Luke Skywalker, has he finally mastered "The Force," which allows him to suspend a tennis ball in mid-air simply by clenching his buttocks? I suppose these questions shall remain unanswered.